CLIMATE Change Minister Penny Wong has been accused of deliberately misleading the Senate over the dumping of the government’s centrepiece emissions trading scheme after she said cabinet had decided on shelving the plan. Mr Garrett revealed the decision was taken by Kevin Rudd’s four-person kitchen cabinet as part of the budget process. He said it was disappointing that the decision had been leaked and he revealed that the first he had known about it was when he had read a newspaper report on April 27. “That was an announcement and a decision that was leaked and I found out about it when it was leaked,” Mr Garrett told Sky News’s Saturday Agenda. 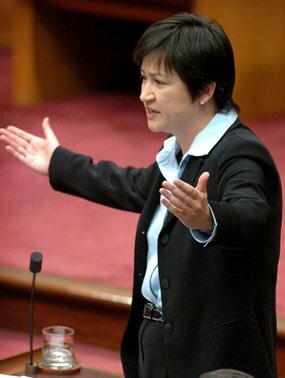 But under cross-examination in Senate estimates last month, Senator Wong said the entire cabinet had made the decision. “Yes, it was a cabinet decision, and I have said the decision was made shortly before announcement, and that is as far as I propose to go in relation to cabinet processes and deliberations,” she said. But don’t forget – this is Labor, so there’s always a way to spin it so that no-one ever has to accept responsibility for anything. In this case, the paper thin excuse is that the term “cabinet” includes any committee of cabinet, and the entirely unofficial assembly of the gang of four counts as a cabinet committee, despite the fact that it doesn’t even have a name, less still a documented role (other than Kevin Rudd’s personal claque). These are Socialists, remember, who believe that saying something is the same as doing it. Does this mean someone has to decide which is lying – Garrett or Wong ? Rudd will have to referee this one.